Single Conductor Baton is rated 4.14 out of 5 based on 29 ratings. The perfect gift for your favorite conductor - superbly balanced featherweight batons! Each come with a plastic carrying tube. Please choose from the following two color options, Zebrawood or Cocobolo. SPECIAL NEW COLOR OPTION: We now have a limited quantity of PURPLE HEART Batons. Same price as the Cocobolo and Zebrawood batons, the Purple Heart is, indeed, a purple toned wood. Call 800-792-4457 to inquire; you may substitute Purple Heart into any of our Conductor baton options listed below. 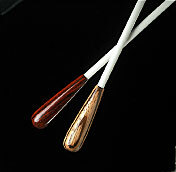 If you're interested in two batons, please purchase our 2 Baton gift set. If you'd like to personalize your gift, consider purchasing our gift set which comes with a case which can be engraved.